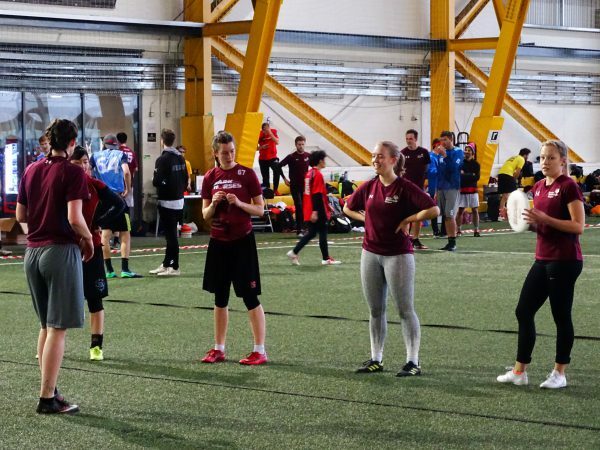 A big shout out to everyone who competed at regionals and congratulations to Strathclyde for sweeping through the tournament to claim SSS gold, hear from them right here! Axel (A): Firstly, congrats on a convincing win! You swept through the tournament fairly easily and have got Strathclyde rolling for the year. We have heard about your new coaches and is this win a testament to their work? What impact has Nicky had since she started coaching you? Hayley (H): Nicky has been amazing so far this season. She has taken all of our women’s only trainings and has brought some new ideas to our defensive systems. She was also a huge help from the sideline offering her advice and perspectives during the weekend. Karina (K): I love having her on the team. She has been great at the trainings so far and really inspires us. It’s great to have another amazing female frisbee player to look up to for the beginners. Individually she’s been a great help (to me) to have as a new captain because of all her experience. Caroline (C): Nicky is also helpful by having someone who picks up on particular things you do that are wrong/need improving which others don’t see because they’re busy playing the game themselves. A: Awesome! As newly crowned winners of the toughest region in the country, who is following this success by trialling for U24s? K: I am for mixed and I think everyone who applied for women’s is being invited to the trial. Eleanor (E): Yeah, I’ve applied for women’s! C: I’ve also put my name in the hat for women’s. A: Good job on applying! How’s the team adapted to losing Katie from the handler slot? Zsófi (Z): We are basically a team of cutters. As someone who mostly handles now but didn’t really do that before, and not most confident doing it at times, the team defo makes it a lot easier as everyone has each other backs. They either get free for you really early on or they save your bad throws by making sick grabs. Everyone is really competent so that makes it work. E: Yeah, I agree, as someone who also hasn’t done much handling before it was quite daunting going in knowing I’d be handling a lot more than usual, but we all know each other so well and work together as a team so smoothly that it really gave that confidence boost, so I knew I could handle it. Z: Lol I see what you did there. C: I feel now that Katie has gone more people have become more confident on disc, especially when it comes to throwing overheads in women’s, firstly because they have to step up to handle and have realised, they can actually throw and secondly in loving memory of Katie’s’ sick scoobs. A: What’s the plan for Nationals? How do you all feel about it? What are you going to work on ahead of it considering you have a while? H: The plan for Nats is to go and play our game no matter what’s thrown at us. Play some shhhhh hot D and have the best time playing as this particular team for the last time #medalchasing. Oh, we’ve entered CWIR to get reps in beforehand. K: At Nats, we gotta keep doing what we’re doing. Training hard and playing together as much as we can. Personally, I’m really excited for it because I think we stand a good chance and I’m excited to play new teams to test out more plays! It’s also our last time as this team playing so I want to just smash it and have an awesome time with these girls. A: Rate your regionals out of 10. And any messages for your rivals? H: 8. We didn’t have a super intense and competitive game where everyone was pumped. C: Yeah, we weren’t challenged by a hard zone or anything so would be good to play different teams and see what they throw at us. A strong message at the end there for all their rivals. Will they still be a class above everybody else at Nationals? We will have to wait and see. This is the last tournament coverage of the semester, we will have some *hopefully* fun holiday and mid-season university things to get involved with, so stay on the lookout! I think you guys just wanted it a bit more.